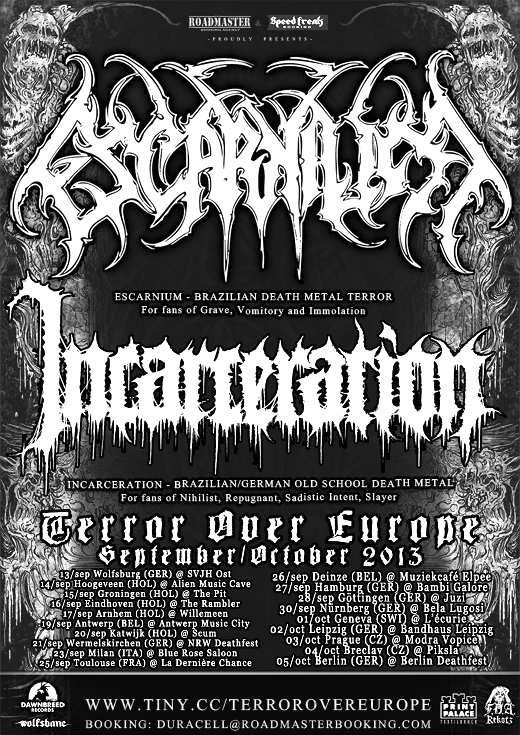 It is with great pride that the agency Roadmaster Booking in partnership with Speedfreak Booking announces the dates of the European tour of one of the biggest names in Brazilian Death Metal, the band ESCARNIUM, along with the Old School Death Metal newcomers INCARCERATION. The “Terror Over Europe Tour 2013” will take place in September and October, and there will be shows in Germany, Belgium, Holland, France, Switzerland and the Czech Republic, including the renowned festivals NRW Deathfest, and Berlin Deathfest. “This European tour represents the continuation and implementation of a work initiated since the launch of our Eex Verminorum EP. For us one more victory is won. Only we, who are involved with Escarnium know how hard this journey has been. The expectations are the best, we will play on two very significant festivals of the German underground, and celebrate the Vinyl release of our Album Excruciating Existence, by the Dutch label Wolfsbane Rec. The band is a bit more mature compared with the last tour. Also we will have some new songs in our set list. And the best part is that we are not alone, we will share it with the band Incarceration, brother band that is taking the scene! Wait for the release of the EP Sacrifice of these guys and you’ll understand what I’m saying.